Penn Manor Education Foundation recently awarded nearly $21,000 in Venture Grants to help teachers in all 10 Penn Manor schools enhance classroom instruction for students. The 27 grants range from $143 to purchase French language scholastic magazines for high school students learning the language to $4,775 to bring a distinguished young-adult author to district middle schools for two days of lectures, student workshops and classroom discussion. Several of the grants paid for new technology, such as iPads equipped with electronic field guides for advanced-placement science courses and portable GPS units to help pupils learn about local topography. But some of the grant-funded projects will help develop “old-school” skills in students. 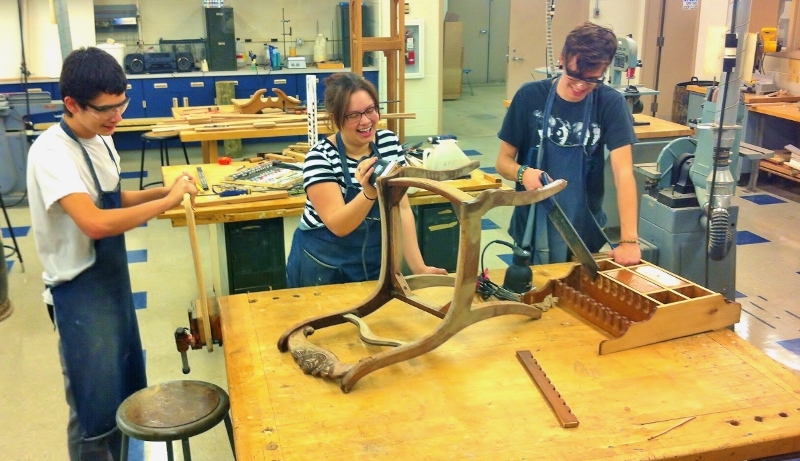 One example is the “Restoring Furniture” project being funded with a $450 Venture Grant. Teacher Nicholas Crowther used the money to purchase second-hand furniture and supplies so students could transform an old piece of furniture into something good enough to be used in their homes. The program involves about 10 students enrolled in Penn Manor’s Twilight alternative education program. Crowther took the students to a used furniture store, where they each had a $35 budget. They bought chairs, a desk, a metal closet, an old console stereo, a display rack and other items. They photographed their purchases and developed a restoration plan before heading to a home improvement store to buy paint, stain, hardware and other supplies. The projects will be completed in late January, and students will be graded on how well they follow and execute their restoration plans. Crowther said his goals for the project are to teach students how to use basic hand tools and follow through on a plan while instilling in them a “do-it-yourself” attitude. Penn Manor Education Foundation has been awarding Venture Grants since 2000 and has distributed nearly $600,000 over the years to Penn Manor teachers to help enhance instruction at district schools. The next round of grants will be awarded in February. 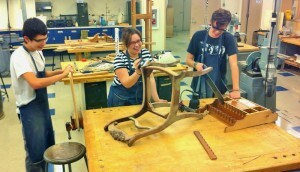 From left, Anthony Fahnestock, Krina Cruz and Gage Dearolf work on their furniture projects under a PMEF grant-funded program.